Background: Oral health is an integral part of general health. It is an essential component of health throughout the life of an individual. Certain systemic diseases can manifest in the oral cavity. Majority of the population approach medical practitioners for their oral health problems at primary health center level. Hence, general practitioners should have adequate knowledge about oral health and also they should play an active role in oral health promotion. Aim: The aim was to assess oral health awareness among undergraduate medical students in Davangere city. Materials and Methods: A cross-sectional survey was conducted using a self-structured, pre-tested, closed-ended questionnaire consisting of 25 questions with options on Likert scale. All the undergraduate students of JJM Medical college and SS Medical colleges were included for the survey. Questions were related to oral health problems and their relation with general health. The data was collected, compiled, and analyzed using Chi-square test. Results: Only 25% of the undergraduate students were found to have good oral health awareness, 38% were found to have fair and 37% were found to have poor oral health awareness. Final year undergraduate medical students were found to have better oral health awareness (40%), when compared to second (13%) and third year students (23%) (P < 0.001). Conclusions: Oral health awareness among undergraduate medical students was found to be poor. Final year undergraduate students were found to have better oral health awareness. Oral health is an essential component of health throughout life. Poor oral health and untreated oral diseases and conditions can have a significant impact on quality of life. They can affect the most basic human needs, including the ability to eat and drink, swallow, maintain proper nutrition, smile, and communicate. However, oral problems are affecting human race since time immemorial, and they are considered as one of the "public health problems." Medical practitioners should play an active role in oral health promotion. Proper knowledge of oral diseases is crucial in medical practice due to the following reasons (a) Periodontal diseases are associated with multiple systemic conditions of medical interest (b) A large number of systemic diseases have oral manifestations. (c) Many drugs are associated with oral adverse drug reactions  and (d) majority of the population approach medical practitioners for their oral health problems. Hence, early screening and proper referral by these professionals may benefit to improve the access to oral health problems and to reduce the associated morbidity and mortality. The need of the hour is for general practitioners to have adequate knowledge about oral health as they are the one to whom majority of the population approach. Today's students are tomorrow's doctors. The knowledge they are going to acquire at present will be reflected in the future during their practice. Exploration of literature reveals that only few studies have assessed oral health awareness among undergraduate medical students. So, the present study was conducted with an aim to assess oral health awareness among undergraduate medical students in Davangere city. The study is an observational, descriptive, cross-sectional survey. A self-structured, pre-tested questionnaire was used for the survey. All the questions were closed-ended and the options were on Likert scale. Validity of the questionnaire was tested by back translational method (Questionnaire in English was translated into Kannada by an expert in literature which was again translated back to English). The reliability of the questionnaire was checked by test and retest method. All the undergraduate students studying in second, third and final year of JJM Medical college and SS Medical college and Hospital were included in the study constituting a total population of 1092 students. The study protocol was approved by Institutional Review Board. The required permission was obtained from the concerned authorities of both the medical institutions. Written informed consent was obtained from the students participating in the study after explaining the objectives, as well as the pros and cons of the study. The data was collected using a self-structured, pre-tested questionnaire. The questionnaire included the demographic details and the information related to oral health maintenance, relationship of oral diseases with systemic diseases and oral health problems and their management. The questionnaire was administered by an investigator during students' leisure hours in the library, college campus and hostel. Students were instructed not to discuss any answers with their friends. Students were also instructed to approach investigator if they have any doubts pertaining to questionnaire. Students filled all the questions in the questionnaire utilizing 30 minutes. There was no missing data. The study was completed within a period of 4 months. 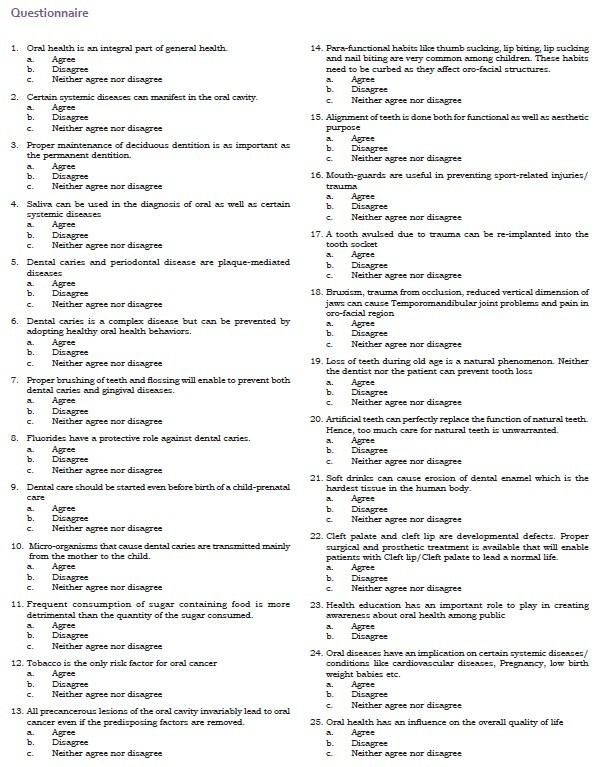 Chi-square test was used to test the significant difference in oral health awareness among undergraduate medical students. Based on the inter-quartile range, all the students were grouped according to their oral health awareness as follows, ≤11 = Poor oral health awareness, 12-16 = Fair oral health awareness, ≥17 = Good oral health awareness. Oral health awareness among undergraduate medical students [Figure 1]. Out of 1092 students, only 266 (25%) were found to have good oral health awareness, 416 (38%) students were found to have fair oral health awareness and 410 students (37%) were found to have poor oral health awareness. The results were significant at P < 0.001. Oral health awareness of second, third and final year undergraduate medical students [Figure 2]. Final year undergraduate medical students were found to have better oral health awareness (40%) when compared to second (13%) and third year (23%) undergraduate medical students at P < 0.001. 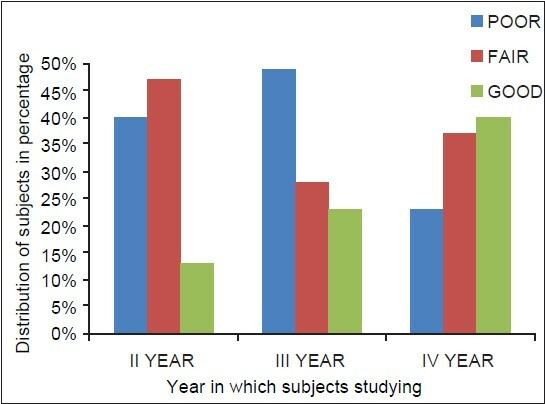 Second year undergraduate students were found to have 47% fair knowledge when compared to 37 % of final year and 28% of third year undergraduate students, Third year undergraduate students were found to have 49% poor knowledge when compare to 40% of final year and 23% of second year undergraduate students. All the results were found to be significant at P < 0.001. Oral health awareness among undergraduate medical students [Figure 1]. 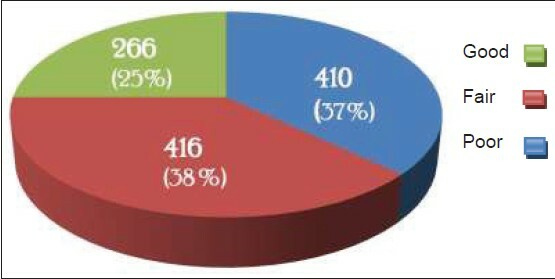 Oral health awareness of second, third and final year undergraduate medical students [Figure 2] respectively. In the present study, the awareness about oral health was found to be poor among undergraduate medical students in Davangere city. The results of the present study are in agreement with the study conducted by Usman et al.,  Doshi et al.,  where clinical medical and paramedical students and medical, engineering students showed poor oral health knowledge respectively, and it is also in agreement with the study conducted by Baseer et al.,  where health professionals showed less knowledge about oral health. The probable reasons could be less clinical exposure of the medical students to oral health problems as they are pre-occupied with their own curricular activities, and also the attitude of the students toward oral health considering it as least important. Final year undergraduate medical students were found to have better oral health awareness compared to second and third year undergraduate medical students. The probable reasons could be more clinical exposure, more experience and knowledge of final year undergraduate medical students when compared to second and third year students. Majority of the second year undergraduate medical students were found to have average oral health awareness when compared to third year undergraduate medical students in which most of them had poor oral health awareness. The probable reason could be medical students are exposed to dental subjects in their second academic year. First year undergraduate medical students were not included in the study as they do not have clinical exposure. It is recommended that oral health awareness of the undergraduate medical students can be improved by incorporating basic information about oral health in their academic curriculum, conducting various inter-disciplinary workshops, CDE programs and conferences, increasing the clinical exposure of the students to oral findings as most of the systemic diseases manifests in the oral cavity, special study modules or electives in oral health and disease should be created by involving the dental faculty, emphasizing the importance of oral health. As prospective doctors - they should have sufficient awareness about oral health as oral health problems are cumulative by nature, more amenable to prevention and difficult to treat. Early identification of the oral diseases and referral to a specialist not only prevents a patient from pain, agony, functional and esthetic problems, but also from death in some conditions. The present survey shows poor oral health awareness among undergraduate medical students, and final year students were found to have better knowledge compared to second and third year undergraduate students. Further studies have to be conducted to explore the reasons. 1. Available from: http://www.indiaonlinepages.com/population/india-current-population.html. [Last accessed on 2012 Jan 14]. 2. Available from: http://www.censusindia.gov.in/2011-Documents/Houselisting%20English.pdf. [Last accessed on 2012 Jan 14]. 3. Kishor KM. Public health implications of oral health-inequity in India. J Adv Dent Res 2010;1:1-0. 4. Available from: http://www.dentistryindia.net/article.php?id=1010. [Last accessed on 2012 Jan 14]. 5. Patel A. Awareness of oral health among medical practitioners in Sangamner City - A cross-sectional survey. Int J Clin Dent Sci 2010;1:26-9. 6. Ramirez JH, Arce R, Contreras A. Why must physicians know about oral diseases? Teach Learn Med 2010;22:148-55. 7. Usman S, Bhat SS, Sargod SS. Oral health knowledge and behavior of clinical medical, dental and paramedical students in Mangalore. J Oral Health Commun Dent 2007;1:46-8. 8. Doshi D, Baldava P, Anup N, Sequeira PS. A comparative evaluation of self-reported oral hygiene practices among medical and engineering university students with access to health-promotive dental care. J Contemp Dent Pract 2007;8:68-75. 9. Baseer MA, Alenazy MS, Alasqah M, Algabbani M, Mehkari A. Oral health knowledge, attitude and practices among health professionals in King Fahad Medical City, Riyadh. Dent Res J (Isfahan) 2012;9:386-92.